The airy and delicate look comes from skinny yarn and a not-so-skinny needle, usually for lace I choose a size 4 or 5 US (3.5mm or 3.75mm) . Compared to knitting socks on a 1US (2.25mm) needle a size 4 needle feels quite comfortable in the hands. Of course if you’ve been knitting on a size 10.5 with chunky weight yarn a size 4 needle is going to feel like a toothpick. Everything is a matter of perspective. 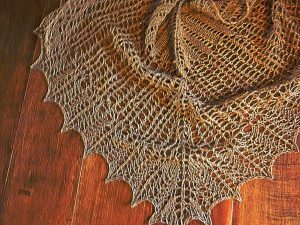 Another trick to making a lace project look airy is aggressive blocking. I’m a fan of wet blocking and using wires and pins to stretch a shawl to the maximum. 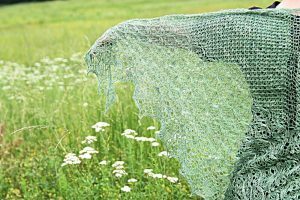 There is usually a little spring back once a shawl is removed from the wires, but the overall effect of aggressive blocking pays off with the utmost negative space between the stitches, which is what ultimately provides the gossamer effect of a lace shawl. Since my last post my size 4 needles have been busy. I’ve got two finished projects, and a cast on to share. This is my second Laminaria, which is knit in Lost City Silk lace weight yarn in colorway Extra Virgin. Laminaria by Elizabeth Freeman is a pattern that is such a joy to knit that many people have several in their project folders on Ravelry. 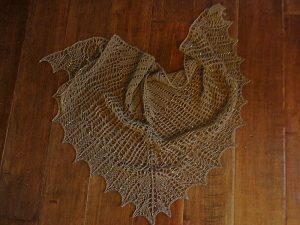 Another finished project is a small Monarch Shawl in lace weight paco-vicuna from Hickory Ridge Farm. While we were at Knitting in the Heartland, I was approached by Gloria and Don of Hickory Ridge to knit a sample project for their booth. The yarn is from Aurora, a paco-vicuna that recently died of old age. For this Monarch I chose the Lace Hind Wing option and added beads while knitting both the Hind Wing and Fringe Charts. The original Monarch Shawl calls for sport weight and a size 7US needle, but with lace weight and a size 4US needle I was able to knit the Extended (larger) version of the second chart and even added several extra rows on the final chart and used as much of the yarn as possible. This sweet little shawl is being shipped today to its home at Hickory Ridge. While I was finishing up the Laminaria in silk I was aching to work on a new design using silk. I’d put the Lafitte Shawl on hiatus some time ago because I wasn’t certain about the second chart. But I finally had the breakthough I’d been hoping for and knew just how to achieve the look I’d been wanting. And that “look” had to be in silk! 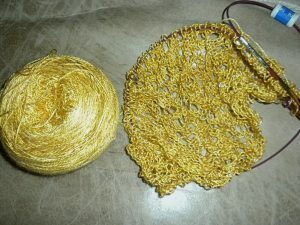 So I’ve cast on a new Lafitte Shawl using Lost City Silk colorway Rumplestilskin. I absolutely love this colorway, it’s bright but not just a pure sunny yellow. The gold color has gentle undertones of brown that will make it easy to wear with blues, reds, greens and even purple. Skinny yarn – and needle size 4US – 3.5mm, naturally. Both are beautiful – and if I was closer, I’d totally come and steal that Laminaria – it’s so my colour! Just come on down and you can borrow it!! !